During my constant research into natural healing, one of the therapies I stumbled across is ozone therapy. Not only interested in its internal benefits, I also looked into brands that sell ozonated oil for topical use. I came across Ozone Factory and their products, and knew I had to try them out! 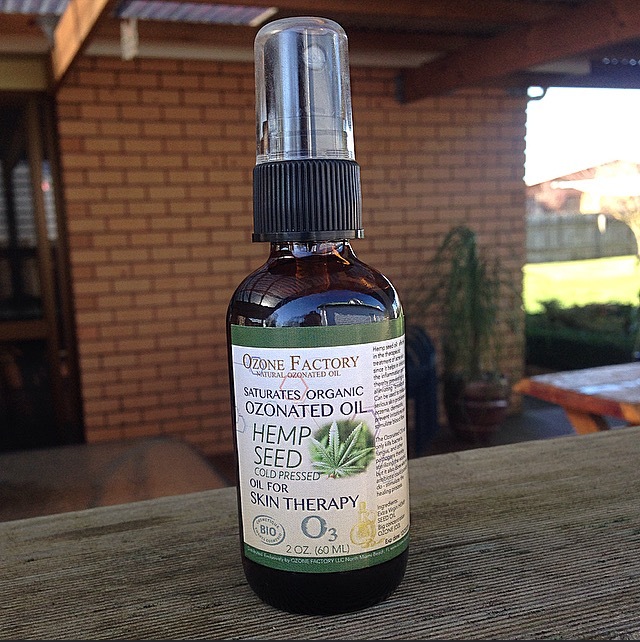 Ozone Factory were generous enough to send me a bottle of their Ozonated Hemp Seed Oil to try out. Ozone (activated oxygen) contains three atoms of oxygen, rather than the two atoms we breathe. This extra atom becomes a scavenger, destroying bacteria, viruses, odours and pollutants in its twenty minute life cycle, before leaving behind pure oxygen. When ozone is bubbled through oil (in the case of this review, hemp oil), it is captured and preserved, up to ten years if refrigerated, creating a gel-like consistency. Ozone combined with Hemp Oil is a killer combination for skin. Hemp Oil has a balanced ratio of omega 6 to omega 3 (3:1), is rich in GLA, is anti-inflammatory and high in antioxidants. It can be used by all skin types, including acne-prone, as it doesn't clog pores, and is a source of vitamin D and E. Hemp Oil is great for promoting thicker, smoother hair, softer skin, and stronger nails. Ozone Factory's Ozonated Hemp Seed Oil has a strong scent, not unlike that of cucumber. This is due to the combination of earthy ozone and hemp seed. I actually don't mind it - I am a lover of earthy and natural fragrances. This oil is truly great in that it is multi-purpose; it can be used on face, body and hair. I have found it really helps with facial acne; it speeds up healing and reduces redness, and reduced the appearance of scarring on my body due to acne and previous injuries. I have used it as a body oil and it provides amazing hydration, and if massaged into sore muscles provides quick relief. It also works perfectly as a hair mask, or smoothed into hair to calm flyaways and split ends. This oil can also be used for skin therapy, healing cellulite, anti acne, anti ageing, and healing wounds that are not healing/healing poorly. The other great thing about this oil is its price point. It retails for $23.95 per 60ml. If you wanted to try this oil out, Ozone Factory are currently offering 10% off all orders with the code OZONEFRIEND10 . Interesting review! will look a bit more into this company.